Earn Necropolis from the Gauntlet! Eternity is nothing but a short while….Necropolis has arrived from the City of the Dead to harvest Souls and wreak havoc in Legacy of the Beast. You can earn Necropolis Soul Fragments and other Rare Rewards in Gauntlet Season 3! Gauntlet Season 3 runs from April 14th to June 23rd, 5pm PT. Battle through 11 Grades of Gauntlet, each presenting unique challenges and rewards to earn a place on our Ranked Leaderboard. 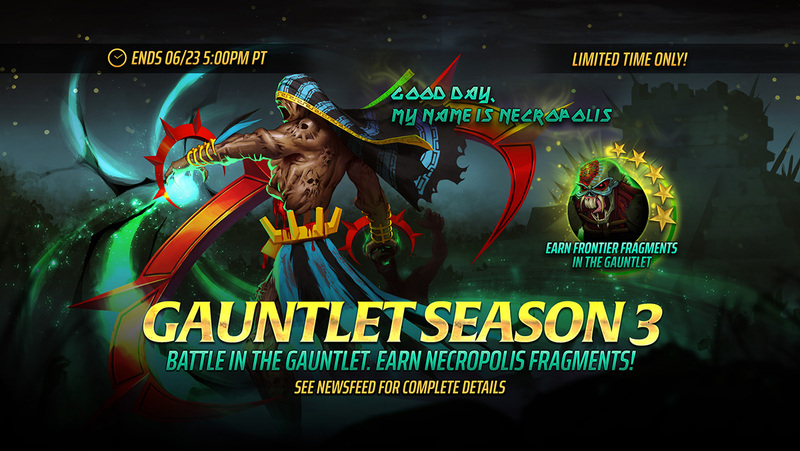 You will have 10 weeks (until the end of Season 3) to earn enough Necropolis Fragments from the Gauntlet to summon him. Once Season 3 is over, he will be much more difficult to obtain, as he won’t be featured in any other soul. These Fragments can be collected over several Gauntlet seasons. Once you have 1,000 Fragments, you will earn a GUARANTEED Final Frontier Eddie**. Final Frontier Eddie is a tanky, all enemy physical damager that specializes in neutralizing his opponents and dealing BIG damage when buffed with Increased Max HP effects. **Final Frontier Eddie is a 5⭐ Sentinel that is only available by collecting Fragments in the Gauntlet.